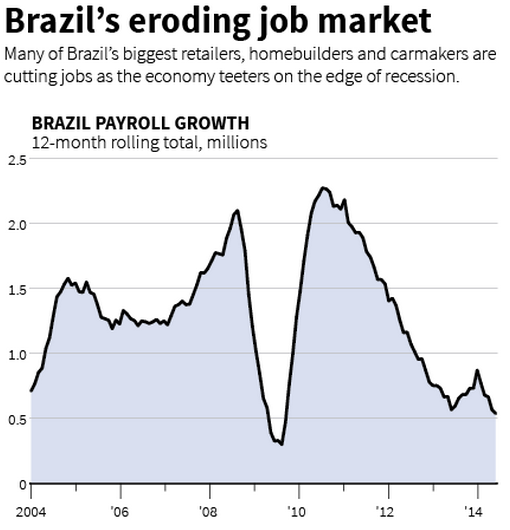 Staying with the South America theme, we are seeing signs of economic troubles in Brazil. To be sure, the nation is still an economic powerhouse – the 7th largest economy in the world. Yet the end of the China-driven commodity supercycle has created significant headwinds for Brazil's economic growth. 1. In recent months industrial production has been declining at the fastest rate since 2009. 2. The labor markets remain under pressure, resulting in declines in consumer confidence. 3. While the consolidated public sector accounts (including state-owned enterprises) remain in the black, the surplus levels continue to shrink. Fiscal deterioration remains a major risk. 4. Even though the nation's banking system has been relatively sound, credit extended by banks to the housing sector has exploded in over the last 5 years. If the economy stumbles, this could become an issue. With economists now projecting Brazil's GDP growth of just 0.79% for 2014 and the national elections approaching, the central bank is injecting new liquidity into the banking system. As usual, central bankers are asked to solve what amounts to structural problems - which they try to address with the only tools they have. 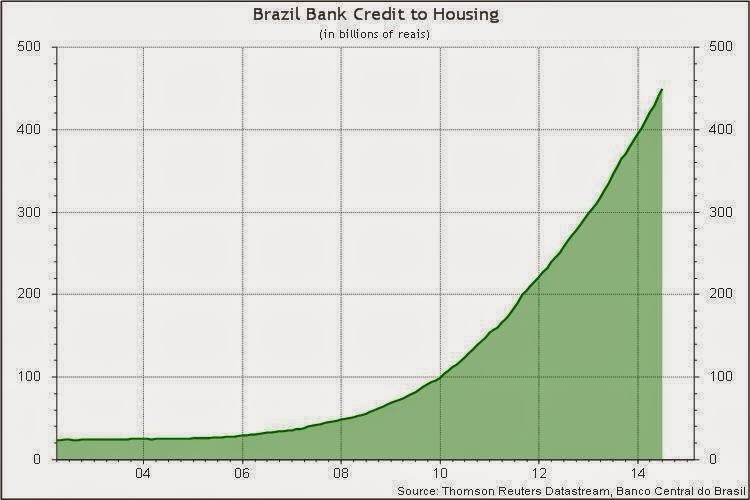 FT: - Brazil has made its second multibillion-dollar injection into the banking system in less than a month as the government struggles to boost the economy ahead of hotly contested presidential elections. The central bank on Wednesday eased rules on reserve requirements, freeing up about R$10bn ($4.5bn) for new lending. Just over three weeks ago, it injected R$45bn into the economy by easing compulsory deposit rules and changing the risk calculation of some loans. While the nation faces a number of economic headwinds, the near-term risk for Brazil stems from the US monetary policy. If rates in the US rise faster than expected, we may revisit the volatility of 2013 (and early this year), as taper fears and capital outflows had sent the Brazilian currency and debt sharply lower (the 10-yr yield reached 13.5%).